Analyzing EZProxy logs may not be the most glamorous task in the world, but it can be illuminating. 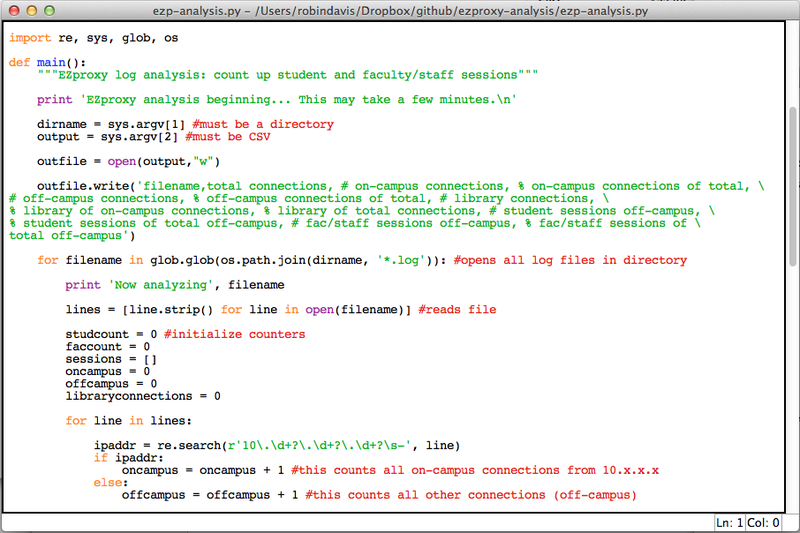 Depending on your EZProxy configuration, log analysis can allow you to see the top databases your users are visiting, the busiest days of the week, the number of connections to your resources occurring on or off-campus, what kinds of users (e.g., staff or faculty) are accessing proxied resources, and more. EZProxy logs are not significantly different from regular server logs. Server logs are generally just plain text files that record activity that happens on the server. Logs that are frequently analyzed to provide insight into how the server is doing include error logs (which can be used to help diagnose problems the server is having) and access logs (which can be used to identify usage activity). EZProxy logs are a kind of modified access log, which record activities (page loads, http requests, etc.) your users undertake while connected in an EZProxy session. 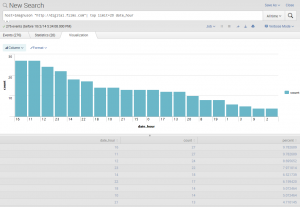 This article will briefly outline five potential methods for analyzing EZProxy logs: AWStats, Piwik, EZPaarse, a custom Python script for parsing starting-point URLS (SPU) logs, and a paid option called Splunk. Logging Starting Point URLs can be useful because those tend to be users either clicking into a database or the full-text of an article, but no activity after that initial contact is logged. This type of logging does not log extraneous resource loading, such as loading scripts and images – which often clutter up your traditional LogFormat logs and lead to misleadingly high hits. LogSPU directives can be defined in addition to traditional LogFormat to provide two different possible views of your users’ data. SPULogs can be easier to analyze and give more interesting data, because they can give a clearer picture of which links and databases are most popular among your EZProxy users. If you haven’t already set it up, SPULogs can be a very useful way to observe general usage trends by database. On a typical EZProxy installation, historical monthly logs can be found inside the ezproxy/log directory. By default they will rotate out every 12 months, so you may only find the past year of data stored on your server. 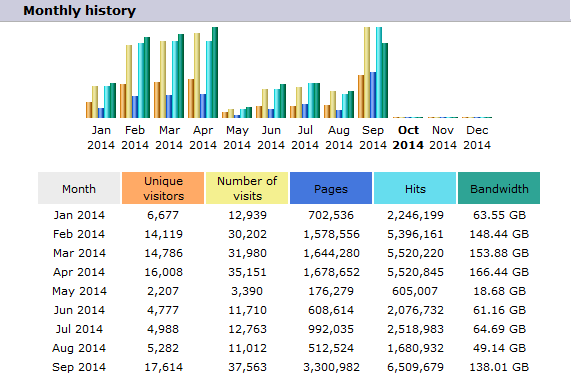 An example AWStats monthly history report. Can you tell when our summer break begins? You can define your unique LogFormat easily in AWStats’ .conf file. 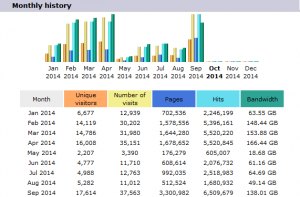 Friendly, albeit a little bit dated looking, charts show overall usage trends. Extensive (but sometimes tricky) customization options can be used to more accurately represent sometimes unusual EZProxy log data. 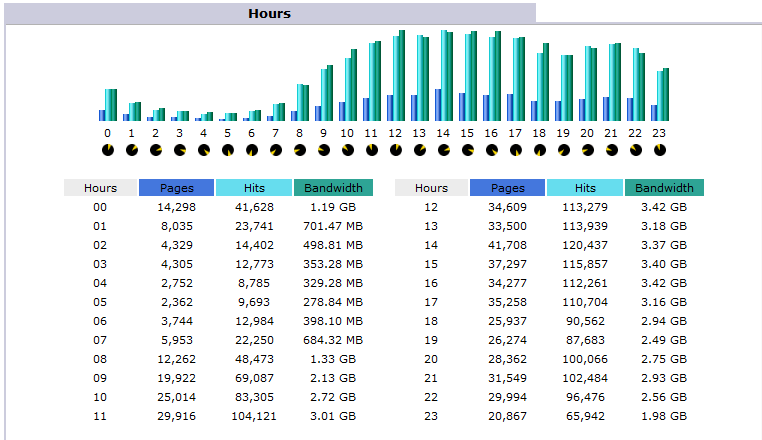 Hourly traffic distribution in AWStats. While our traffic peaks during normal working hours, we have steady usage going on until about Midnight, after which point it crashes pretty hard. We could use this data to determine how much virtual reference staffing we should have available during these hours. If you make a change to .conf files after you’ve ingested logs, the changes do not take effect on already ingested data. You’ll have to re-ingest your logs. Charts and graphs are not particularly (at least easily) customizable, and are not very modern-looking. Charts are static and not interactive; you cannot easily cross-section the data to make custom charts. 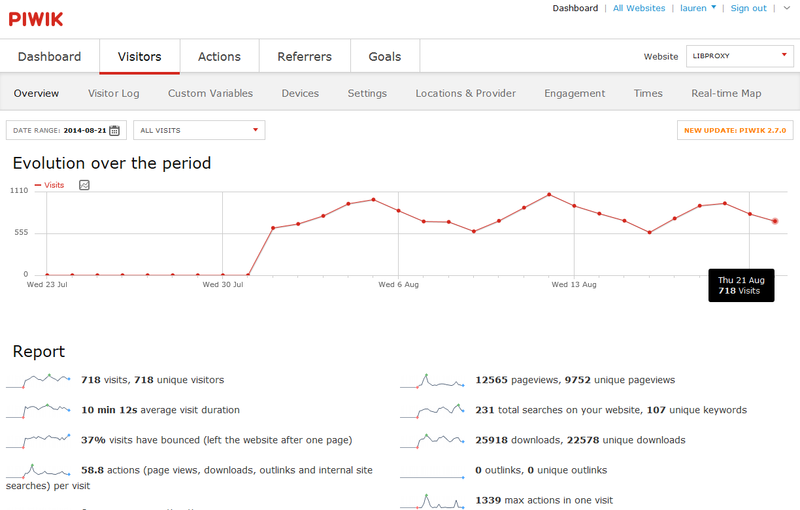 The Piwik visitor dashboard showing visits over time. Each point on the graph is interactive. The report shown actually is only displaying stats for a single day. The graphs are friendly and modern-looking, but can be slow to load. The charts and graphs generated by Piwik are much more attractive and interactive than those produced by AWStats, with report customizations very similar to what’s available in Google Analytics. If you are comfortable with Python, you can do additional customizations to get more details out of your logs. To ingest a single monthly log took several hours. On the plus side, with this running on one of Lauren’s monitors, anytime someone walked into her office they thought she was doing something *really* technical. By default, parsing of large log files seems to be pretty slow, but performance may depend on your environment, the size of your log files and how often you rotate your logs. In order to fully take advantage of the library-specific information your logs might contain and your LogFormat setup, you might have to do some pretty significant modification of Piwik’s import_logs.py script. When looking at popular pages in Piwik you’re somewhat at the mercy that the subdirectories of database URLs have meaningful labels; luckily EBSCO does, as shown here. We have a lot of users looking at EBSCO Ebooks, apparently. ezPaarse’s friendly drag and drop interface. You can also copy/paste lines for your logs to try out the functionality by creating an account at http://ezpaarse.couperin.org. 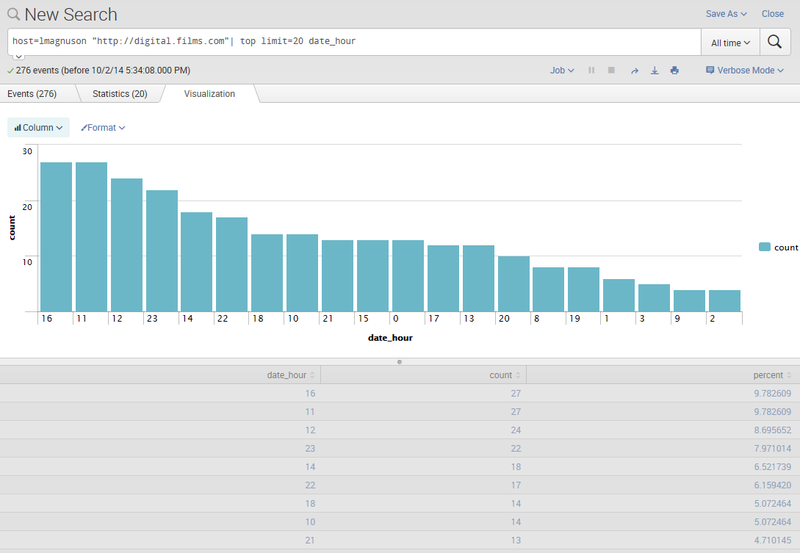 Has a lot of potential to be used to analyze existing log data to better understand e-resource usage. Its goal is to be able to associate meaningful metadata (domains, ISSNs) to provide better electronic resource usage statistics. 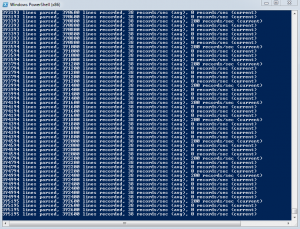 ezPaarse Excel output generated from a sample log file, showing type of resource (article, book, etc.) ISSN, publisher, domain, filesize, and more. In Lauren’s testing, we couldn’t get of the logs to ingest correctly (perhaps due to a somewhat non-standard EZProxy logformat) but the samples files provided worked well. UPDATE 11/26: With some gracious assistance from EZPaarse’s developers, we got EZPaarse to work! 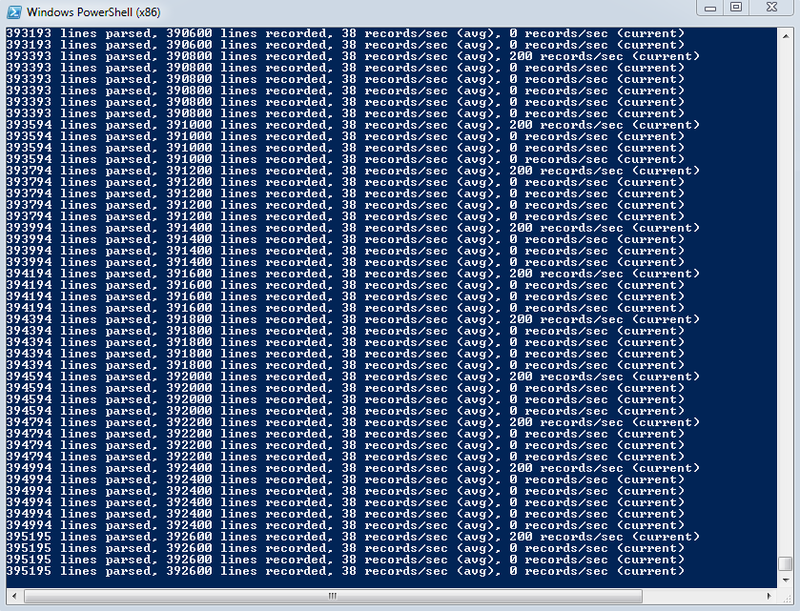 It took about 10 minutes to process 2.5 million log lines, which is pretty awesome. Lesson learned – if you get stuck, reach out to ezpaarse [at] couperin.org or tweet for help @ezpaarse. Also be sure to try out some of the pre-defined parameters set up by other institutions under Parameters. Check out the comments below for some more detail from ezpaarse’s developers. Output is in Excel Sheets rather than a dashboard-style format – but as pointed out in the comments below, you can optionally output the results in JSON. You will become very familiar with the data! As librarians in an age of user tracking, we need to have a very good grasp of the kinds of data that our various services collect from our patrons, like IP addresses. If your script is fairly simple, it should run quickly. Robin’s script took 5 minutes to analyze almost 6 years of SPU logs. Your output will probably be a CSV, a flexible and useful data format, but could be any format your heart desires. You could even integrate Python libraries like Plotly to generate beautiful charts in addition to tabular data. If you use Python for other things in your day-to-day, analyzing structured data is a fun challenge. And you can impress your colleagues with your Pythonic abilities! Action shot: running the script from the command line. If you have not used Python to input/output files or analyze tables before, this could be challenging. The easiest way to run the script is within an IDE or from the command line; if this is the case, it will likely only be used by you. You will need to spend time ascertaining what’s what in the logs. If you choose to output data in a CSV file, you’ll need more elbow grease to turn the data into a beautiful collection of charts and graphs. It’s really strong in interactive searching. Rather than relying on canned reports, you can dynamically and quickly search by keywords or structured queries to generate data and visualizations on the fly. Here’s a search for log entries containing a URL (digital.films.com), which Splunk uses to display a chart showing the hours of the day that this URL is being accessed. This particular database is most popular around 4 PM. 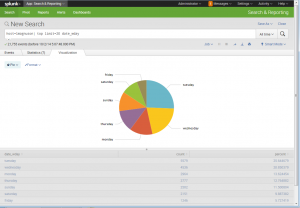 It has a little bit of a learning curve, but it’s worth it for the kind of features and intelligence you can get from Splunk. It depends on your needs, but AWStats is always a tried and true easy to install and maintain solution. If you have the knowledge, a custom Python script is definitely better, but obviously takes time to test and develop. 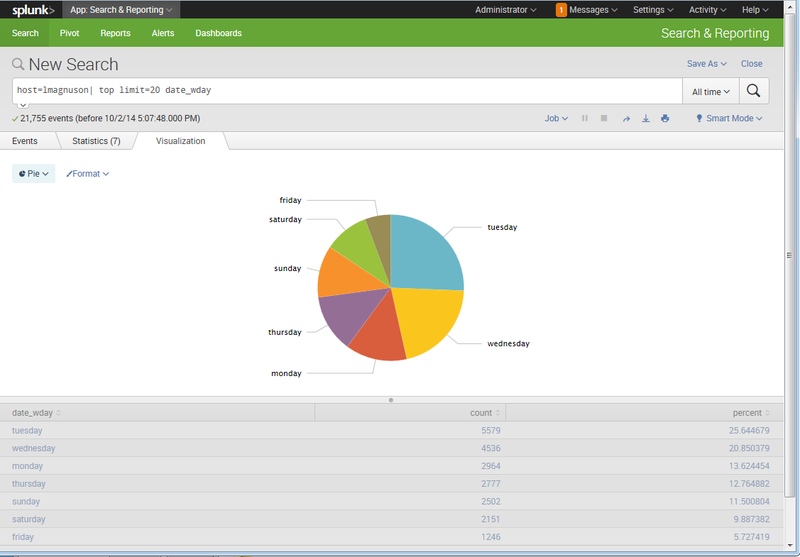 If you have money and could partner with others on your campus (or just need a one-time report generated through a free trial), Splunk is very powerful, generates some slick-looking charts, and is definitely work looking into. If there are other options not covered here, please let us know in the comments! About our guest author: Robin Camille Davis is the Emerging Technologies & Distance Services Librarian at John Jay College of Criminal Justice (CUNY) in New York City. She received her MLIS from the University of Illinois Urbana-Champaign in 2012 with a focus in data curation. She is currently pursuing an MA in Computational Linguistics from the CUNY Graduate Center. Hello and thank for this overview and your review of ezPAARSE: for us (i.e. the ezpaarse team), it’s nice to have feedback as it provides us with precious information to try and make our (free and open source) software and its documentation better. – ezpaarse being under development : we are working in an agile way and deliver thoroughly tested and functional software on every iteration. The version 2.0 is just out! – collecting bibliographic information on the accessed resources is a core feature of ezpaarse and is made possible because we manually analyse editors’ platforms (see http://analogist.couperin.org/platforms/start) to write parsers and assemble knowledge bases when it’s possible. – the default output of ezpaarse is csv (or, more precisely tsv) but can be changed to json if you want to use the results in a different way. You can have a look on bibliomap (http://bibliomap.inist.fr) to see an example of a live display of ezpaarse results. Awesome! Thanks so much for this additional information; it is super helpful. I definitely did not know about the option to output the data in json; that is pretty great! I will definitely send you guys some samples from my logs – I do think my unusual logformat is the culprit here, and will look forward to getting some feedback on getting my EZPaarse configuration right. I’ll update the post here with more details when we’ve got it working.